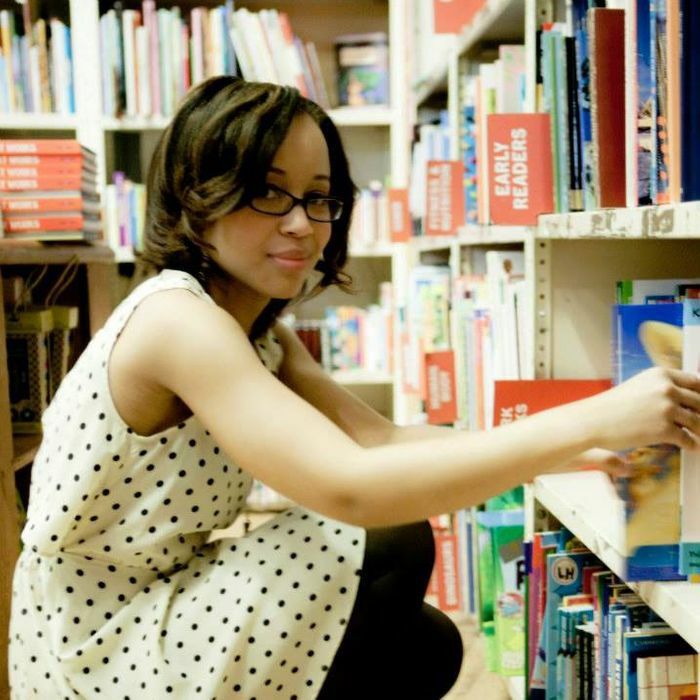 Dhonielle Clayton, author of the forthcoming fantasy novel The Belles, also works as a sensitivity reader. Clayton, now 34, is one of the chief executives of We Need Diverse Books, a nonprofit founded in 2014 to support writers from marginalized groups and to advocate for more diversity in publishing. She’s the co-founder of a book development company, Cake Literary, that specializes in books about diverse characters, and she’s got a fantasy novel of her own, The Belles, coming out next month. She’s also working in the booming business of sensitivity reading. Over the last few years, the number of books about nonwhite characters has spiked. In 2016, more than a quarter of young adult and children’s books featured characters of color, compared to just 10 percent in 2013. There’s a catch, though. Most of the authors are white. As a sensitivity reader, Clayton’s job is to help nonblack authors avoid portraying black characters in a way that feels inauthentic or uninformed. She herself relies on sensitivity readers to improve her writing — for her first book, she hired 12 different readers to review aspects of the story that she and her writing partner didn’t base on firsthand experience. The way she sees it, the job of a sensitivity reader is first and foremost to improve the literary quality of a book by steering the author away from one-dimensional portraits and clichés. But some have likened the readers to “censors,” and the press coverage of the industry has often reflected this attitude. Most recently, a Times headline pondered whether sensitivity readers “result in better books, or censorship”? Clayton, who was interviewed for the piece, responded with a series of tweets expressing her dismay at the article, which she says failed to accurately capture the nature of her work. Most vexing to her, the article didn’t address a crucial problem at the core of the publishing industry. “The reason I’ve done over 35 sensitivity reads this year alone is b/c publishers aren’t hiring black content creators but everyone wants to write about black people,” she wrote. Although she’s made a business of helping nonblack writers, she’s ambivalent about the demand for her services. Vulture caught up with Clayton to discuss her work as a sensitivity reader. How did you get into the work of sensitivity reading? It started really casually. In grad school, I’d be in workshops and people would want to write about a black character, and then they’d turn to me, the only other black girl, and ask me to read their work. And then after I got my book deal, other writers in my debut class would ask me to take a look at a character. They just wanted a second set of eyes. And then my name started circling. I debuted in 2015 and We Need Diverse Books kicked off in 2014, so the industry was starting to change and we were starting to talk about these issues. That’s around when two books were published about happy slaves making dessert for their owners, and some readers were furious. Those stories both got big press and publishers got scared. Then they started reaching out to people who were in the industry to see if we would do a read. So that’s how I got pulled in. Honestly I think it’s because I’m involved with We Need Diverse Books — I think they think that if I read it, they’re good. The publishing industry has always had sensitivity readers, but I started getting more people reaching out to me when I got involved with We Need Diverse Books. That’s also around when the number of books written by white authors about characters of color started to spike. That’s the most important piece of this conversation. The fact is that sensitivity reading is a band-aid over a hemorrhaging problem in our industry. That’s what we should really be talking about — that’s what real censorship looks like. The systematic erasure and blockage of people of color from the publishing industry. Do you think it’s also because books about characters of color are perceived as lucrative right now? I think that’s partially true, but I think the other thing is that these writers think they’re doing the world a service. Like, “Look at me, I’m showing up for the social-justice movement.” But the problem is that they’re showing up and they’re taking a seat. And they’re not realizing that them writing a story about a black kid prevents me from writing one, because when I show up with my manuscript, the publisher tells me that the position is filled. Two or three times. My agent sent a manuscript out and then we got a rejection back that said they already had a manuscript that is similar and then they gave the title, and I looked it up and found out that the author was, indeed, a white woman who’d written a story with a black girl in it. I’ll never have my agent send anything to those editors again. One of the ideas I’ve seen repeatedly come up is this concern that sensitivity readers will prevent authors from portraying characters that are prejudiced or imperfect in some way. Let’s take The Black Witch and American Heart – two controversial books that each tell the story of a prejudiced white character becoming woke. Is there a way to do a story line like that well? Absolutely. Any premise can be interesting, it just has to be written well. Look at Kate Elliott’s books. Look at Tessa Gratton’s books. Look at Marie Rutkoski’s The Winner’s Curse. These authors take these really big premises that are problematic, but because they’ve analyzed power and what power is in a narrative, and because they are well read and have done their research, they know how to dismantle these things on the page. The premise of The Winner’s Curse is about a girl who buys a slave and then the power structure between them flips, and there’s a romance — which is inherently problematic — but the way that Rutkoski does it is that she takes away the white girl’s power and it’s fascinating. It’s because she’s a good writer. She literally dismantles privilege and power and slavery on the page, and you are there for it. It’s so good. I think one of those writers could have taken the premise of American Heart and done what needed to be done. So when you are doing a sensitivity read and you come across a problematic character or story line, how do you handle it? I try to explain it as best I can. Most people are shocked by the blind spots they discover. I read a middle-grade book about a little black girl who loves to go to national parks, and I told the author that the first thing she needed to reconcile was, how did this black girl get into national parks? Historically, black people weren’t allowed to visit national parks, so going to national parks is not a thing we do, as a group. I wrote to her that if this little girl loves to camp, you need to figure out how that happened, how that passion was stoked, how her parents and grandparents felt about it. Or you have to make her white. Because otherwise it’s a paint by numbers diversity piece and it rings false. I believe that author is still working on it and trying to figure that out. Did you ask her why she wanted to write a black character in the first place? I did. The same canned answer always comes back: This character just walked into my head fully formed. If I hear that one more time. I don’t know where this answer comes from, but it’s hilarious to do a read aloud of every single author who has that same exact answer. Do you think part of the reason you care about this so much is because of your own experience reading books as a kid that struck you as racist or wrong? Exactly. Things that were wrong, and things that I was embarrassed by. Books where I was like, “Oh no, this is the black character in this book? This is awful.” Reading was super important to me, but I picked up fast that in most of the books that I wanted to read — the fun books — the brown people were all coded as evil. The people who looked like me were always the villains. So when I got my master’s in children’s literature and I studied the entire canon and I saw the patterns of how black children were represented, I said, I need to do something about this. I need to learn to write. I need to systematically help change the publishing landscape and show them what diversity could look like if we only packaged it in a fun and exciting way. That’s where Cake Literary and my body of work came from. What do you think about the media coverage of sensitivity readers? Do you notice any common threads among the various pieces? Almost all of these pieces mischaracterize what sensitivity reading is. It’s a targeted beta read. I’m not the diversity police officer, policing non-marginalized people. No. Really what we’re doing is helping the author write a better book.